Marshall Wace and AQR are the biggest short sellers of Deutsche Bank. Marshall Wace even added to their short position on the day when a 3.1% stake in Deutsche Bank by activist hedge fund, Hudson Executive Capital, became public. An about $650 million big stake in Deutsche Bank by activist hedge fund, Hudson Executive Capital became known on 2018-11-01. For more about this see WSJ article here. In this note, we focus on the short selling side and look at recent activities of the biggest Deutsche Bank short sellers. As of the latest short disclosures, three hedge fund hold a short in Deutsche Bank. All three are very well-known names in the hedge fund industry: AQR Capital 2.59% short (about $550m), Marshall Wace 1.41% short (about $300m) and Renaissance Technologies 0.48% (about $100m). AQR has been reducing short position in Deutsche Bank since September. This short went from as much as 3.13% in September down to 2.59% in October. Similar reduction happened to another long-term short by AQR - their Commerzbank short went from 1.81% in August to 0.79% most recently. On the other hand, Marshall Wace has been increasing their Deutsche Bank short in the past weeks. This short position went from 0.99% on 2018-10-10 to 1.41% in 2018-11-01. Interestingly, the latest short increase (from 1.31% to 1.41%) happened on the very day when 3.1% stake of Hudson Executive Capital was revealed. 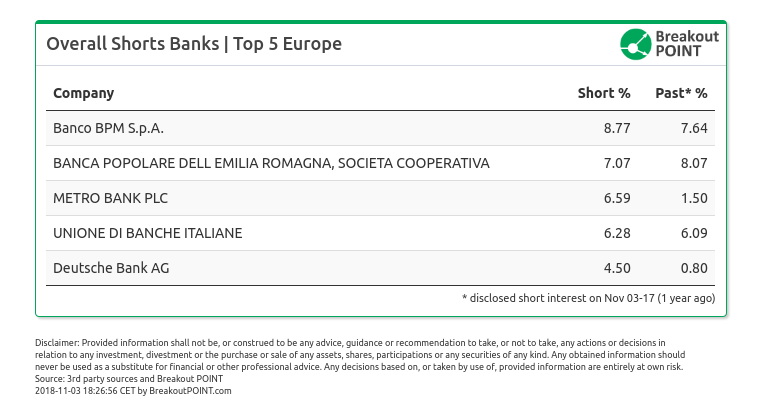 Short selling in EU banking sector by Marshall Wace and AQR goes much beyond their Deutsche Bank shorts.These two have the most big shorts among EU banks. Especially Marshall Wace stands out with 13 such short positions. Such high number of Marshall Wace's short positions does not come as a surprise, and as we analysed in our "Who Shorted EU?" 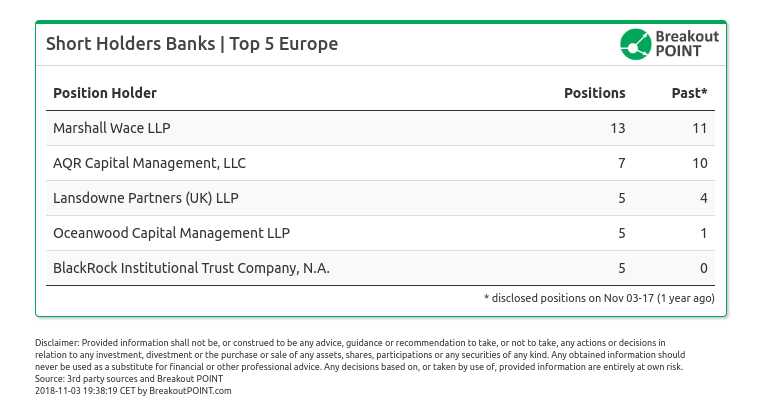 post, they have by far the highest number of significant short positions across EU.